I popped to Smyths last week with my daughter and spotted a brand new addition to the Fingerlings family.... Fingerlings Minis! They are priced at just £2.99 each which is an absolute bargain! Fingerlings Minis are adorable pencil toppers. There are several to collect. Each blind bag comes with a mystery mini monkey, unicorn, or sloth and each one has a different status: rare, exotic, or ultra-rare. 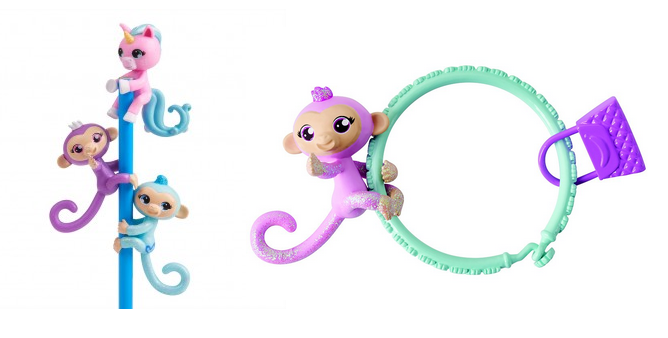 Alongside your mini Fingerling you also get a bracelet and a charm to add to it. You can hang your Fingerling from the bracelet too! At the moment the Fingerlings Minis are not available online however we found them in store at Smyths so I expect them to be online very soon plus at other stores as well. We will keep you updated so be sure to bookmark this page for regular updates.